Prince Harry has joined national celebrations marking the 50th anniversary of Barbados' independence - and shared a stage with superstar Rihanna to launch a spectacular concert. Harry and the Barbados-born singer were cheered by thousands as a night of music, dance and song began to mark the moment - November 30 1966 - the Caribbean country broke away from British rule to forge its own destiny. A message of support from the Queen had been read by Harry, during a Toast the Nation event, with the monarch saying since independence Barbados had "continued to flourish and grow into a strong and confident nation". And Harry had his own message of encourage for the country, urging its young people to tackle issues like climate change, which is having an impact in the West Indies, and develop ways of coping with the changes technology will bring. He told the concert crowds at the Kensington Oval cricket ground in the capital Bridgetown: "Your independence was a declaration of confidence in the future. "And 50 years on Barbados is a country rightfully proud of its vibrant culture, its sporting prowess, and its natural beauty that attracts visitors from all over the world." 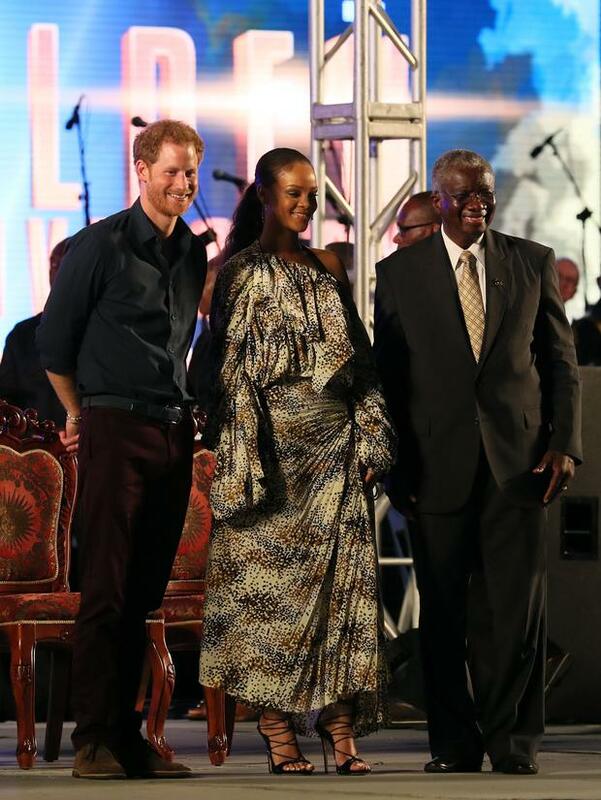 Throughout the opening of the concert Harry and Rihanna sat next to each other on stage with prime minister Fruendel Stuart and his minister of foreign affairs and foreign trade, Maxine McClean. The Prince said: "Like other young people around the world, the young people of Barbados face challenges. "You look into the future and wonder how technology will change your lives. You wonder how you will obtain the skills and resources to compete in a rapidly changing world. And I know that you worry about the impact climate change will have on island nations like yours. "What I say to you is this: the solutions to these challenges will not come from anyone else. The answers must come from you. Good things happen to good people; believe you can make change; and if you lead by example, others will follow." The prime minister also spoke and when he welcomed Harry to the celebrations there was a cheer from the crowds and some of who began chanting his name which made the royal smile. But when he mentioned their home-grown superstar, "Robyn Rihanna Fenty", there was an even bigger response and the singer smiled to herself. Harry, who is on a 15-day tour of the Caribbean, brought on to the stage a Bajan environmentalist, Jamilla Sealy, and said, to cheers from the crowds, she had been named one of the Queen's Young Leaders for 2017. He told the spectators: "She has been selected as one of the 60 exceptional young people from across the Commonwealth who are making an extraordinary impact in the lives of others. "She will travel to London next year to build relationships with her peers from around the world and to be honoured by Her Majesty at Buckingham Palace. I know that we will be hearing a lot more about her in the years to come." Among the Bajan artists performing during the night was Red Plastic Bag - Stedson Wiltshire - a hugely popular calypsonian singer who has performed in Europe, America and the Caribbean to great acclaim during a career spanning more than 30 years. Earlier on Wednesday at the Garrison Savannah racetrack where the Barbados flag was raised 50 years ago signalling the moment the nation became independent, a national monument commemorating the milestone was unveiled. Harry joined the prime minister, governor general Sir Elliott Belgrave, dignitaries and hundreds of Bajans at the event which was postponed from Tuesday following a torrential rainstorm. After Barbados' heritage was celebrated with poetry, music and dance the Prince, prime minister and Barbados cricket legend Sir Garfield Sobers each in turn went up a special walkway which led to the monument. Called the Pathway from Independence to the Present, it was line with embossed plaques highlighting Barbados' defining moments and benches bearing the names of successive leaders. The monument was a large round platform with a sundial at its heart and during the unveiling ceremony Sir Garfield placed a time capsule in the monument. He was followed by Mr Stuart who put a broken trident - featured on the Barbados flag and denoting a break from a colonial past - into the new national symbol. The prime minister last year signalled his intention to make the Caribbean island a republic and to replace the Queen as head of state with a ceremonial president. The country's Democratic Labour Party (DLP) said the removal of the Queen as head of state was expected to coincide with the 50th anniversary of Barbados's independence, but substantive plans have yet to be taken forward. Finally Harry slotted a gnomon - the projecting piece of a sundial - into the time piece, symbolically inviting all to embrace the present and make a personal commitment to the future. A huge flag of Barbados was unfurled above the monument and the crowds were treated to a spectacular firework display. Today is World Aids Day and later Harry will visit a "Man Aware" HIV drop in centre in Heroes Square, in the centre of Bridgetown, where he will meet volunteers manning the stands, and members of the public stopping to have a chat and seek advice. Later Harry will travel to the Bajan countryside to visit the Nature Fun Ranch where young people are helped with their personal development. The ranch allows youngsters to speak freely with one another about important topics, including HIV/Aids and provides them with a positive focus while tending to horses, working vegetable patches, or managing fish hatcheries. Harry, a former Army officer, will also tour Paragon Base, the home of the Barbados Defence Force, to learn how the eastern Caribbean countries work together at the Regional Security System. His day will end with him attending the 50th Anniversary Military Parade at Kensington Oval which was postponed due to Tuesday's downpours.